Home / STORE / Wedding & Anniversary Nisse. 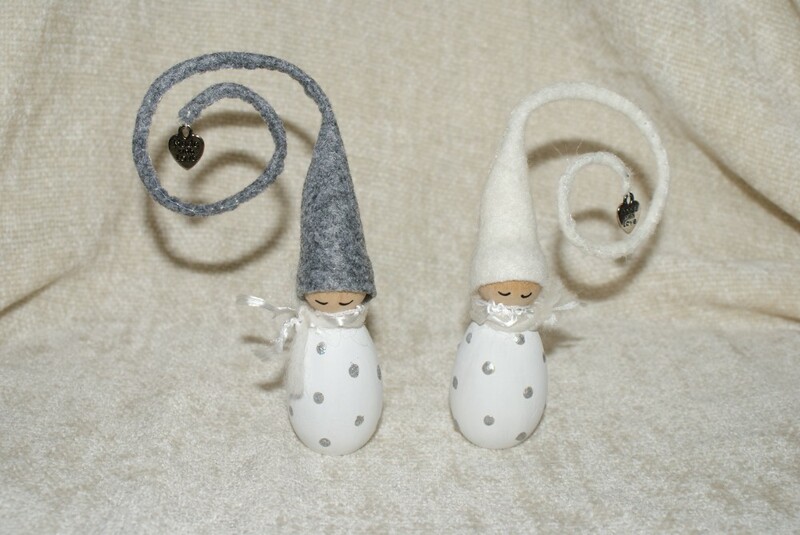 These little Nisse are a cute collectible keepsake to celebrate your own or others Wedding Anniversary’s. The keepsakes begin with the wedding Nisse, bride and groom, the groom has a grey hat while the bride has a white hat. Anniversary’s are celebrated every year until the 15th year after which they are celebrated every 5 years. Each year is celebrated by a different item such as paper, silver, ruby etc, see list below. The items which are with certain Nisse are not necessarily the real item but a substitute which resembles the item. They have wooden bodies painted white decorated with silver spots. In their wooden ball hands they are holding the significant item to represent the Anniversary year. They are also wearing a white felt curly hat decorated with a metal heart shaped charm at the tip.